Just a quick note that the ‘Who Killed the Black Baron‘ scenario can now be found on the Battles page. Thanks very much to Barry Doyle for his help in formatting it! As many of you know, I am a gunner (artilleryman) and I really like the way that TOI handles artillery fire. The Call for fire might be a bit high but reflective (many a fire mission can go astray with bad comms…and this is WWII!). Spotting rule…all good and correct. Drift…exactly. My beef comes next…firepower. So I’ve gone through all the steps to call down fire and all I get is 4 dice…to suppress!! What, am I calling down a guy with a grenade launcher?! It just doesn’t make sense! If a single mortar (let’s even assume it’s a fair sized mortar) gets 4 dice to suppress (without having to jump through the fire procedure) then why would artillery ordnance only get 4 as well? One can only assume that you would at least be calling down a battery of guns. For a main killer in WWII, this branch is owed it’s due in this great system…otherwise, the artillery deck goes often unused. Haus Rule – Artillery attack values equal card value +2 dice (wide blast included). I’ve run across an issue a few times now that is more prevelant in Tide of Iron but does at times occur in Memeoir ’44 as well. Some scenarios will have an ‘exit hex’. The point here is to get some of your units off in order to score points. Sounds easy enough. But both my wife an I have developed a ‘clog’ strategy to this end. The ‘clog’ is simply a matter of putting units in such a was as to prevent the exit of a unit often with your friendly units camping out on the exit hex. This forces your opponent to muster the firepower to knock that unit aside before it can exit. While sometimes it may be a slight delaying tactic at other times, it may cost the game. Admittedly, this does seem to occur more in TOI than M’44. There are two reasons for this. One, in TOI, more than 1 unit can occupy the exit hex which results in more units to eliminate to clear the hex and two, TOI seems to have a more restricted exit policy in that only a couple of hexes actually qualify as exit hexes. M’44, for the most part, has exit hexes as the entire back row. I put the clog strategy into action not long ago in the TOI scenario competition winner, Blood on the Mountain (good, solid scenario. I can see why it won!). 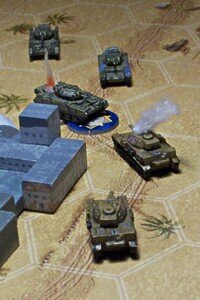 My American forces were relentlessly being hammered (and a devastating un-observed artillery strike!) but I was comforted in the fact that there was a time limit and all I had to do was hold a couple of key hexes. While I lost the majority of my forces, I carried the game due to the Clog. I’m curious as to what other gamers think about the exit hex dilemma…thoughts? The Desert War Heats up! I’ve been in a bit of a scramble all this weekend preparing for our gaming session. We had completed the base set of scenarios for Tide of Iron (and a few user designed ones…the competition voting ends soon!) and with the new Mediterranean expansion just around the corner for Memoir ’44 I really wanted to crack open Days of the Fox and get into it. My problem has always been I want the full kit before I start playing (I still remember back to Battle Cry when I read the rules and though…”oh, I have got to paint these figs first!”). This can sometimes delay the playing. Fortunately with Tide of Iron, the figures are few and I could paint them up in a fraction of the time. Of course, I had to make my terrain as well! However, yesterday I ran into a new problem…I needed Pz IVe’s! So ironic how I was just mentioning how the M’44 tanks could easily be converted. So I worked feverishly yesterday to get them prepared for Operation Crusader, the Days of the Fox tank battle. While I lost the battle, I managed to get them done on time and into play. They acquited themselves well scoring a few knock outs. There are a few new vehicle images in the gallery. Days of the Fox is an excellent Tide of Iron expansion. 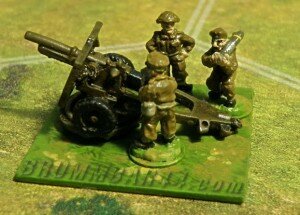 I really enjoy the figures (no doubt those 88’s will be in action as guns for the Memoir ’44 desert battles as well). With the prices set to rise on the Fantasy Flight Games, fans of WWII gaming would be wise to grab a copy of both the base game and the expansion.